On day 3 of the Alan Turing Centenary Conference in Manchester I had to leave after lunch and so I missed the afternoon sessions. However, the morning session was excellent. Garry Kasparov: The world chess champion took us through the story of Turing's world-first chess playing program. Turing didn't have a computer to execute the algorithm, so he carried out the calculations by hand, taking 15 minutes to execute a move. Turing's algorithm was pitted against humans, and one of the matches was transcribed. Kasparov and colleagues collected the rules of Turing's chess playing program and implemented it. When they tried to reproduce the game, the results deviated from the game transcription 10 times. Presumably, Turing got bored in his hand-calulations, assumed what the answer would be, and just moved the piece. Live at the conference, Gary Kasparov played a game of chess against the implementation of Turing's program, and Kasparov very quickly won in 16 moves, with a commentary as he did so (pointing out moves that were "not the greatest choice!"). See Gary Kasparov's talk. Rodney Brooks: The roboticist talked about Turing's unpublished 1948 paper "Intelligent Machinery", which discussed embodied robots. They were impractical in Turing's lifetime. In this paper Turing also says that machines that never make a mistakes could not be intelligent, that humans are not machines because they seem to be able to do mathematics despite Godel's famous theorem, and discusses the role of neurons and brains and their resemblance to a universal machine. Brooks showed how the field of robotics had benefitted from the exponential laws about processor speed and availability of sensors, and now there are many things we can do in robotics that Turing would not have thought possible back in 1948. In fact many things that look intelligent when humans do them, turn out to be the result of relatively simple laws, and his group's research can make robots look human-like just by taking care of how they move their gaze to track an object, or how they use prosody and movement to look as if they have emotions. See Rodney Brooks' talk. The Turing test (or "Imitation game") was repeatedly mentioned in several contexts by several people, including for its primary use - a discussion of whether AI is achievable and how we will know when we've made it. Michael Rabin reminded us of Turing's contribution to decidability, the halting problem and computability. Edmund Clarke reminded us that Turing was the first to realise that software verification would be important. Yuri Matiyasevich reminded us of the work Turing did in number theory and that his work is still used in computing zeros for the Reimann zeta function. Adi Shamir reminded us of Turing's work in encryption. Fred Brooks reminded us of Turing's efforts to create early computers (and his Turing machine) and his thoughts about whether intelligent machines were possible. Leslie Valiant and others pointed out that Turing had categorised 3 types of search: intellectual search (search algorithms taught now in all AI courses), genetical search (genetic algorithms, evolution) and cultural search (gaining knowledge as a community by interaction). Garry Kasparov reminded us that Turing made the first automatic chess playing program. Rodney Brooks told us that Turing wrote about the possibilities and problems for embodied robots long before they could be built. Hans Meinhardt told us about Turing's work in understanding the formation of biological structure. 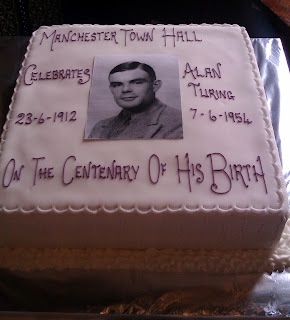 Happy Birthday Alan Turing! Where will computer science be in another 100 years? See also my writeup of Day 1 and Day 2 of the conference, and the online video recordings of the talks.